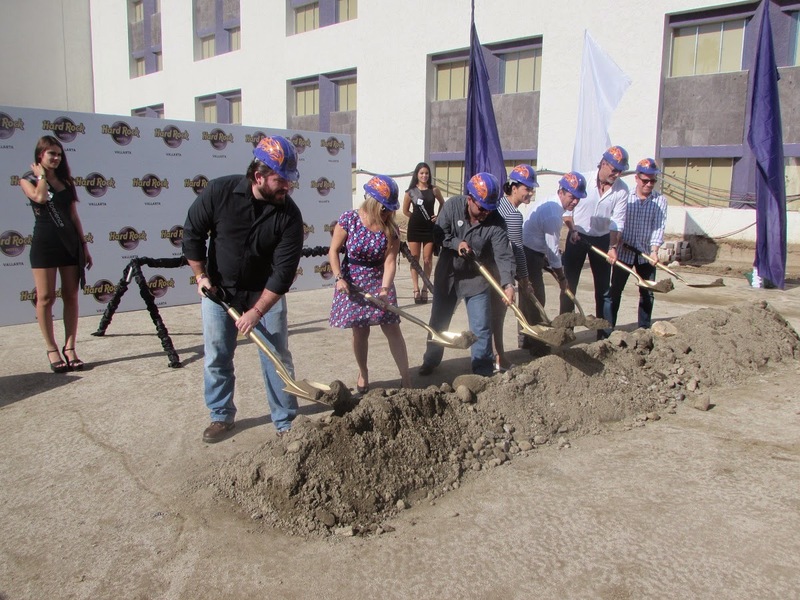 Hard Rock Hotel Vallarta began construction with a projected end date of Summer 2015 on an event space that will be ready to host shows, sports and, most importantly, tourism activities including conventions and exhibits for up to 1,500 attendees. The cornerstone for the new Hard Rock Hotel Vallarta International Convention Center was laid on October 7th, heralding the construction of what will be the largest convention center ever built in the Riviera Nayarit. Construction will be completed by Summer 2015 on the center, which will hold up to 1,500 attendees. It will have 1,200 square meters of space (26 meters in length, 48 meters in width and 7 meters in height) and will be able to be divided into four separate sections. The premises will host conferences, seminars, cocktails, banquets, presentations including concerts and theater shows, as well as sports events such as basketball games, just to name just a few. Manuel Rubio, Sales Director for the Hard Rock Hotel Vallarta, wanted this diverse gamut of events to be possible in order to increase not only the occupation of his hotel, but also of the entire destination itself. Rubio thanked the Government of the State of Nayarit for its support, as well as the Riviera Nayarit Convention and Visitors Bureau; the latter teamed up with the hotel to distribute the good news throughout Mexico and beyond its borders. “We plan to launch a promotional package for meeting planners in the United States and Canada, as well as in Mexico and throughout Latin America in order to garner more attention. We want them to know there is a very professional convention center in the Riviera Nayarit, with cutting edge technology and room for large events,” he added. The building will be constructed to one side of the main entrance of the hotel, which is located in Nuevo Vallarta. It will have a spa and its own entrance in order to receive the general public. The Riviera Nayarit CVB would like to congratulate the Hard Rock Hotel for this grand initiative and forward vision that will undoubtedly improve the destination’s tourism offerings. I am pleased to have these details about this convention center. Truly, it is a large convention center and I also had attended a business event over there. Now that all of the construction work is complete so I would like to host the grand annual business dinner party over there. Hello Drew, it will be a pleasure to host your annual business party, could you please contact us to: info@rivieranayarit.com; so we can assist you with it.